Arsenal have confirmed a triple injury boost ahead of our Premier League clash with Leicester City but Sokratis and Petr Cech remain major doubts for the game. Let’s start with the good news and Danny Welbeck is available for selection after overcoming a minor hamstring injury that forced him to withdraw from the England squad ahead of their Nations League games with Croatia and Spain. Mesut Ozil is also set to return to the squad after returning to full training following a back injury. The playmaker picked up the issue during our 5,000 mile round trip to Azerbaijan earlier this month and he missed the 5-1 win at Fulham before the international break but he’ll be in the squad to face Leicester. Ainsley Maitland-Niles is also pushing for a recall to the squad on Monday after making a full recovery from a fractured leg that he sustained during the defeat to Manchester City on the opening game of the season – although Unai Emery may give him more time to work on his fitness. 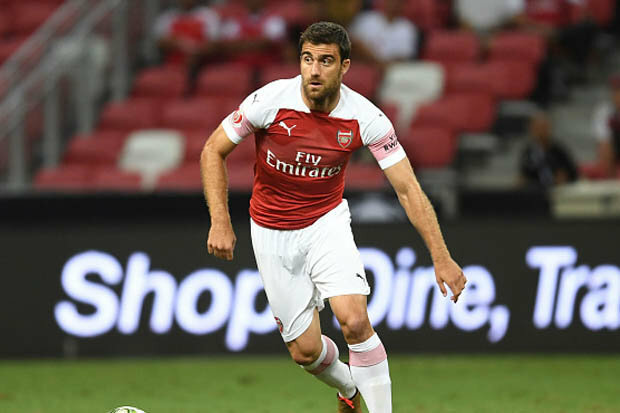 However, Sokratis remains a major doubt for the game on Monday as he’s struggling with an ankle injury that he picked up while playing for Greece against Finland earlier this week. Petr Cech is also in danger of missing the visit of Leicester with a hamstring injury that he sustained against Watford late last month so Bernd Leno is on stand-by to continue in goal. Following this update, Emery then held his pre-match press conference this afternoon and he provided further insight in to Sokratis and Cech’s fitness with the boss suggesting both players may miss out against Leicester. The players are coming back now. Only Sokratis had one problem, one small injury. Maybe for Monday it’s difficult [for him to play]. Petr Cech is getting better from his injury but he’s not training with the group. But I think he’s very close to start with us. It will be a blow if Sokratis misses out on Monday as he’s been a rock at the back in recent weeks. Rob Holding is set to continue alongside Shkodran Mustafi in the middle of defence if the Greek star is ruled out.